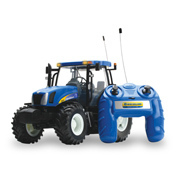 When a push along tractor simply won’t do the job, you need one that can be controlled remotely. These tractors are available in different sizes so if you want to find a trailer or any other accessories to go with them, be sure to check out the scale before you buy. The use of radio control in models has been seen since the 1950s. Your child can drive these models from a small distance away. Driving away from you is fairly easy but if you try and turn around and drive back towards yourself it is a bit trickier. Everything is backwards! Should you turn left or right? Can you keep the tractor in a straight line? These are things that even some adults find difficult so maybe you could set up a course and have a competition. You need to imagine that you are actually sat in the driving seat of the tractor and move the tractor to the left or right according to the way you want to go. Keep practicing. You will soon get the hang of it. Once you’ve mastered the basics you can make it even more challenging for yourself. Have you ever tried backing up to a baler or even reversing a trailer? There is so much fun to be had. Driving a model tractor by remote control can help to improve driving skills and basic awareness as well as stimulate your logical thinking and spatial awareness. With realistic sounds on these miniature tractors, it will be easy to imagine you are driving the real thing.